The video-sharing Web site on Friday morning launched its “Don’t You Forget About Me” channel, featuring several clips seeking the whereabouts of more than 25 missing children from around the world. YouTube, which was bought by search-engine giant Google (GOOG) last year, began the channel in conjunction with the International Centre for Missing and Exploited Children and the Find Madeleine Campaign, the organization devoted to finding Madeleine McCann, the English toddler who vanished from a hotel in Portugal earlier this summer. 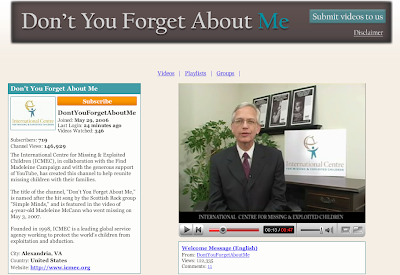 The first clip on the introductory page, which plays automatically, is a message from Ernie Allen, president and CEO of ICMEC. First lady Laura Bush and English soccer star David Beckham offer their own video testimonials in support of the channel and the effort to find Madeleine McCann. The channel is named after the 1985 hit by Scottish band Simple Minds, which is also the audio track for the Madeleine McCann video clip. • Click here for YouTube’s “Don’t You Forget About Me” page.